The true beauty of Dawson City and the National Historic Site of the Klondike Gold Rush in the Yukon Territories, Canada is shown through this wall mural. 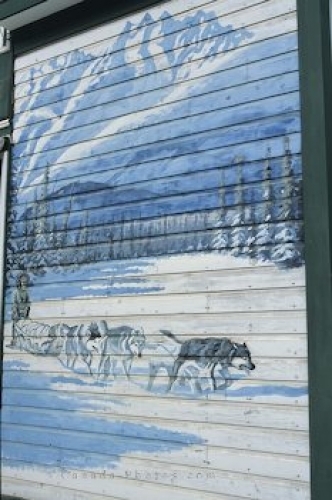 A mural painted on a door at the Klondike Gold Rush in historic Dawson City in the Yukon Territories tells the tale of a man with his dog sled team making it across the snow covered landscape. This wall mural shows the true beauty of the Yukon Territories and the lengths that people had to go to transfer their goods. National Historic Site, Klondike Gold Rush, Dawson City, Yukon Terr., Canada, North America. Picture of a wall mural displayed at the Klondike Gold Rush site in Dawson City in the Yukon.